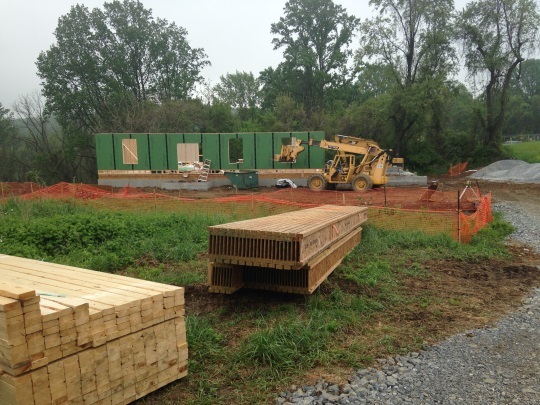 Forest Ridge Builders is owned by John Smucker, Lancaster County native and 15-year veteran of the construction industry. John recently answered 7 questions about his company, family and how Amish builders work. 1. Who are you, and how did you get into the construction business? My Name is John Smucker, married to Lavina (Beiler) since December 5, 2000. We live in Lancaster County, PA where we both grew up, we have deep roots here. We have 3 daughters – 11, 9, 6, and two sons – 4 and 1 – as of 2014. I have big dreams of working with them in our business someday, and am always happy when my 4-year-old son bombards me with questions about what, why, where questions about equipment and tools. I worked at various agriculture-related jobs from seventh grade to age 18. I definitely credit that era for building a work ethic. My father had a masonry contracting business at that time, which led to my avid interest in building but prevented me from being active in it at that age. I entered the construction field at age 18 and worked my way up through the levels, until I started my own firm in 2003. 2. What types of jobs do you do? 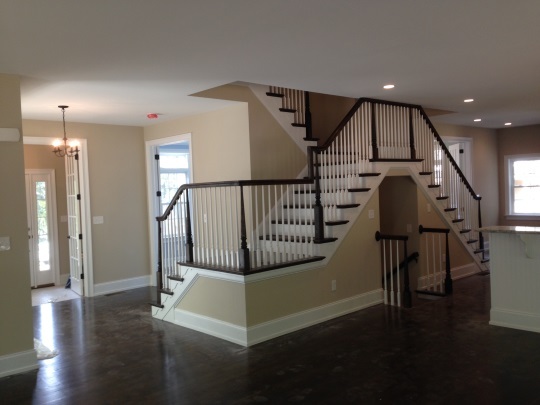 We do a wide range of projects, with new custom homes and additions being at the top of the list. We also do renovations of all types, decks and porches, roofing and siding replacement and makeovers. We find ourselves performing a lot of stucco remediation jobs, where we remove faulty stucco, repair water damage and install fiber cement siding. All of our projects feature turn-key service, including design options and obtaining permits. We believe in quality workmanship, clear communication, and a strong work ethic. 3. What areas do you cover, and what’s the farthest you’ve gone for a job? 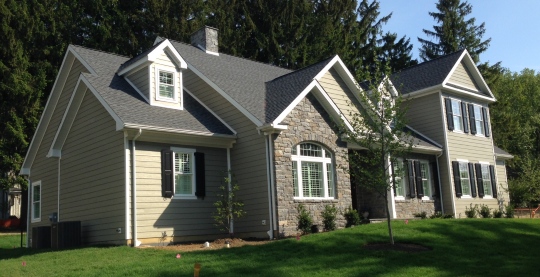 We focus primarily on Lancaster and Chester counties in PA, but have followed referrals, etc. into Delaware, Montgomery, Bucks counties in PA, as well as Wilmington, DE. We try to stay within 45 minutes travel time, but have gone as far as two hours for certain situations. Communication – A contractor should be able to answer your questions to your satisfaction and you should feel comfortable with his answers. The two of you have to communicate well because you’ll be seeing a lot of him. Get multiple bids – Be sure to get proposals from two or three different contractors. They should be detailed and break down major aspects of the job in writing, not just giving a flat price for the entire home with little further explanation. Look beyond price – Price shouldn’t be your only criteria. The two most important factors in choosing a contractor are how well the two of you communicate, and the quality of his workmanship. Spend more if it means having someone you’re comfortable with. 5. People wonder about technology used by Amish. How does that work? Do you use regular electric tools on the jobsite? How do you get there if you don’t drive? We do use typical power tools, often powered by generators if power is not yet available at a new home site. In fact we often find ourselves with the most advanced building tools in our quest for continual improvement and efficiency. While we do have mostly Amish employees, we do try to keep a balance of non-Amish employees too, and have them operate the company vehicles with the Amish employees as passengers. This helps us all stay open-minded and appreciative of people from other cultures too. 6. How is your family a part of your business? I have my shop and office in a separate building at our home address, so while I am not nearly always in the office, this does help make me more available for those random moments of interaction or need. Lavina and I spend Thursdays together in the office as we designated that day for payroll, accounts payable and receivable and she helps handle that. We hired a neighbor girl to come and take care of the children that day as well as contribute mightily to housekeeping and cleaning. She is a great worker. 7. What’s your favorite thing about having your business? And least favorite? My favorite things about our business are the flexible times I can carve out for school functions, family trips, hunting, etc. I also enjoy the daily interaction with employees and customers, being able to positively affect someone’s sense of well-being. My least favorite things are the times when the workload seems overwhelming and reduces time spent with family, and the occasional customer who doesn’t respect evening hours being reserved for family as much as practical. You can find Forest Ridge Builders online at forestridgebuilder.com. Beautiful looking craftsmanship! I love the dual access stairway…very practical! Are most of Forest Ridge’s customers English or Amish? Once again, I like these “getting to know about Amish businesses” postings. Thank you! I’m almost certain they are majority English. They would probably need to be given the number of builders in the Lancaster community, even as big as it is. We visited four or five of John’s homes the day I spent with him, one was Amish (a relative of John’s I believe) and the rest English. The vast majority of our customers are “English”. We do occasionally build for Amish neighbors and friends and very much enjoy that, but our typical customer is non-Amish in the Chester County PA area. Enjoyed reading the post.. Thanks! The pictures presented show beautiful workmanship. thank you. Amish carpenters were used by an English-run company for some of my house renovation. After the renovation, it was found that the concrete cement siding was not applied per manufacturer guidelines (eg, felt behind each joint to maintain vapor shield) and there was no drip edge applied at the bottom of the siding; also, the roofing was not applied correctly in certain areas. I was able to remedy the drip edge and roof “readjusted,” but the siding issue just has to be “lived with” — the warranty, however, was voided. There is no contractors exam required in Pennsylvania. A contractors license is required to ensure proper insurance etc, but no demonstration of competence is required. The good news is that in this area, poor workmanship or incompetence can soon result in a contractor going out of business to due the abundance of competition. The burden of selecting a good contractor is definitely on the homeowner though, thus the high level of interest in this topic whenever we write about it or discuss it. I feel it is important to be knowledgable about building codes and products and to stay abreast of changes to them in order to do a good job and stay profitable. Hello, I found your web site on the internet. I don’t know how far you are from Kingston, NY 12401. I am looking for an Amish cabinet maker in my area to construct new kitchen cabinets. If you know of an Amish contact in my area I would appreciate it if you could email me a telephone number or email address. I have found several Amish websites on the internet that advertise kitchen cabinets online. I don’t know if this is common practice? From the photos on the internet, the cabinets look beautiful. It is concerning for me to order online using my measurements.